Priority Sign can now also create business cards for you! Our cards are standard size (3.5" X 2"), printed either horizontally or vertically in full, vibrant color on one side, on heavy duty, bright white glossy card stock. Business card pricing starts at $65.00 for 1000 cards, including basic layout. 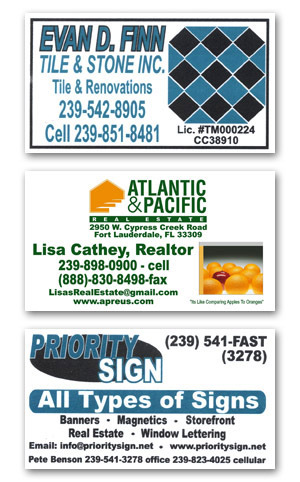 Priority Sign can also create two-sided, folding or other specialty business cards. Please call today for a quote!